At the NBC Universal Experience the other day in NYC, The Real Housewives of NYC put their best face forward as they walked the red carpet (no, not Alex’s carpet) and smiled pretty for the cameras with their dull-white teef! I never understand when people who are in the spotlight don’t have blindingly white teeth (i.e Audrina Patridge). You know you’re going to be on camera, why not kick ’em up a notch? 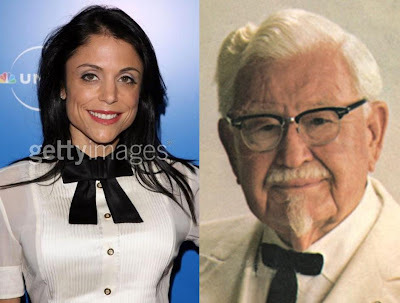 Anyway, all the girls were out and about and Bethany, my least favorite, was clearly channeling Colonel Sanders with her “I’m your slave owner” white shirt and black tie on. It’s nice she’s trying to bring “plantation chic” back. 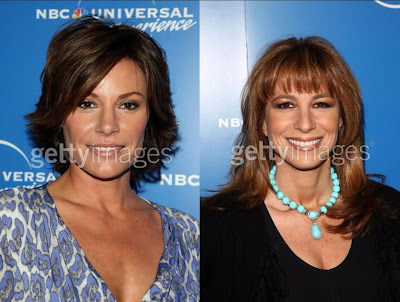 Then you have Countess “That Means Nothing in the US” LuAnn and a bit of her rack and, my second favorite Jill Zarin. I want to have shots with Jill Zarin and knock over a 7-11. She seems like good company. However, I’ve saved the best for last. No, not Alex. Although she is looking more and more like a lightbulb each and every day and I’m sure that has something to do with “Going Green” so I guess that’s a good thing. My favorite is Crazy Eyes Runaway Bride Romona! Sadly her eyes aren’t looking as perky and crazy as her rack, but still borderline insane. Once I zoomed in, I noticed that she’s looking more and more like Marlo Thomas each and every day. It’s nice to have goals. Now that The Hills is over for a few months I’m hoping they bring this crazy cats back sooner rather than later. Real Housewives is really like The Hills…only droopier….and I’m ok with that.